Cook thinly sliced ramps slowly in butter or oil over medium low heat until soft. Sprinkle lightly with our, stir and cook for 1-2 minutes. Whisk in cold cream and bring to a boil over medium heat. Add in goat cheese, salt and pepper. Stir until thickened. Remove from heat. To make the crostini, cut bread into thin slices. Brush with oil. Grill on the barbeque over medium high heat for just a minute, until lightly charred. the woody bottom of the spear. 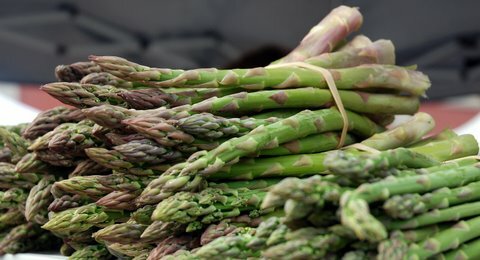 Place asparagus on the grill over medium high heat for 1-2 minutes until lightly charred. Remove from gill and season with butter or oil, salt and pepper. Cut into small pieces to t on crostini. Assemble the tartines by placing a spoonful of bechamel onto the crostini, top with asparagus and shave pecorino on top.